There cannot be a more polarising figure in Formula 1 today than Sebastian Vettel. He has been at the receiving end of booing fans at several races this year. But at the same time, according to Red Bull Racing boss Christian Horner, Sebastian Vettel merchandise flies off the shelves like you wouldn’t believe. By the same token, there are many people who reject the idea that Vettel’s phenomenal success might be down to talent or skill. Considering he has won three World Drivers’ Championships, and is on the verge of clinching his fourth, a surprising number of people come up with a long list of explanations why it’s all just the world’s biggest fluke. Most of those explanations are bunk. In fact, I am seriously considering whether Sebastian Vettel might be the greatest driver the sport has ever seen. Sebastian Vettel’s list of achievements is so long that the fact that he is the youngest champion in F1 history is a bit of a footnote. In a way, it was merely a continuation of a trend that has seen young drivers become better prepared during their rise to F1. Vettel was the third person in six years to become the youngest ever champion, following Fernando Alonso and Lewis Hamilton. But what sets Vettel apart from Alonso and Hamilton is the fact that he has kept on going. Alonso won two world championships in a row. And while he has remained a strong driver, he has never yet won a third. Where we stand today, Alonso has failed to reach his potential. Meanwhile, Hamilton won his one championship, and has not truthfully ever come close to winning his second. When Alonso and Hamilton fizzled away, Vettel just kept on going and going. And he shows no sign of stopping. Not only is he the youngest ever world champion, but by winning three in a row he placed himself among nine most successful drivers ever, at the age of just 25. If he wins a fourth championship, he will be in the top four, alongside Alain Prost, Juan Manuel Fangio and Michael Schumacher. If he wins a fourth in a row he will be only the third person in history to do so, after Juan Manuel Fangio and Michael Schumacher. When Schumacher achieved that, he was 34 years old. Fangio was 46 (although it was a very different era indeed). Vettel would be 26. People often compare Sebastian Vettel and Michael Schumacher. This makes sense from a statistical point of view. In terms of numbers, Schumacher is the man to beat, and Vettel is the first person who has ever looked like he could beat him. But I think Sebastian Vettel’s achievements tower far and above Schumacher’s. The first thing to point out is that Michael Schumacher always benefited from team orders. The only exception was 1999, when he was ruled out of title contention after suffering a broken leg in a mid-season crash. Beyond that, every single decision made in both Benetton and Ferrari revolved around the needs of Michael Schumacher. While many suspect Red Bull Racing of favouring Sebastian Vettel, the evidence for this is pretty scant. Let us not forget that the biggest controversy of Vettel’s career – the “multi 21” scandal at this year’s Malaysian Grand Prix – came about as a result of the German defying team orders to stay behind Mark Webber. OK, so that happened very early on in the season. But Schumacher would never have been asked to stay behind his team mate. Remember Austria 2002, which was also early in the season. Rubens Barrichello grudgingly pulled over to let Schumacher past on the final corner of the race, having had the upper hand all weekend. Besides, we all know that Mark Webber is a free spirit. He is not the sort of person to take team orders. Indeed, a cynic might suggest that he is actively assisting Fernando Alonso this season, such is his dislike for Sebastian Vettel. Webber certainly did not make things easy for the German in the final race last year, in Brazil. Mark Webber would not really play dirty. But even if he wanted to, he would not be able to. He simply is not fast enough to do anything that would detract from Sebastian Vettel’s championship charge. Vettel’s dominance over Webber is intimidating. So far in 2013, Vettel has outqualified his team mate in all 13 races. No other driver has achieved that. Vettel has seven race wins; Webber has zero. If Sebastian Vettel’s speed was all down to the car, why is Mark Webber not achieving similar results? Webber is an excellent driver with a great deal of experience. But Vettel is on another planet in comparison. In Vettel’s three championship seasons so far, Red Bull Racing has had eight one–twos. In the past 12 months there have been just two. Compare this to the years of Ferrari dominance in the 2000s. In Michael Schumacher’s first three championships with Ferrari, the team clinched 15 one–twos, almost twice as many as Red Bull Racing. Across all five of Schumacher’s championships with Ferrari, 27% of all the races ended in a Ferrari one–two. Red Bull Racing have only achieved the same in 13% of races since 2010. The Red Bull is a great car. But it provides nothing like the advantage that the Ferrari gave Michael Schumacher. If Vettel’s success is all down to the car, why did Mark Webber finish only sixth in last year’s Drivers’ Championship? I can already hear Sebastian Vettel’s detractors saying that it’s because Mark Webber gets all the bad luck. But the statistics simply do not back that up. An analysis of issues affecting the Red Bull drivers shows that since 2009, both drivers have suffered from 33 mechanical issues. Vettel has had eight race-ending mishaps; Webber has had only three. It might seem as though Mark Webber suffers from more bad luck. In reality, that perception is down to confirmation bias. The people that point to Sebastian Vettel’s car advantage are rather quiet on the topic of his first grand prix victory, in a Toro Rosso. His first victory was assured and dominant in challenging wet conditions. It was a true one-off for the Toro Rosso team, which just three years earlier had been Minardi, the likeable team that perennially brought up the rear of the field. Toro Rosso’s next best result is two fourth places, both achieved by… Sebastian Vettel. The highest any other driver has finished in a Toro Rosso is sixth. You might not yet be convinced. You could point out that Sebastian Vettel has a vital ally in Helmut Marko. No doubt this is true. But ask yourself why Marko is an ally. Goodness knows, Helmut Marko does not stick by a driver just for the fun of it. His Red Bull Junior Team is famously ruthless when it comes to its drivers. The organisation is not shy of summarily dumping its drivers very quickly indeed if things are not going well. The list of former Red Bull Junior Team drivers is unbelievably long. The organisation has no patience. It has sacked the likes of Brendon Hartley, Karun Chandhok, Vitantonio Liuzzi, Jaime Alguersuari — and that is just the tip of the iceberg. OK, so none of these drivers may have been championship material. But they all deserved better. With the right nurturing they could each have achieved so much more. This year, rumours have been swirling about the future of António Félix da Costa on the basis that he has had a difficult half a season in Formula Renault 3.5. Da Costa is the lucky one — Lewis Williamson was sacked after just three weekends of Formula Renault 3.5 last year. Sebastian Vettel made it through this pressure cooker environment not just unscathed, but with flying colours. He has earned his support from Helmut Marko. There is another point about the comparison with Michael Schumacher. Not didn’t just have the entire Ferrari team revolved around him. His influence extended far beyond just his team. Nowhere was this more true than with Bridgestone, who effectively provided bespoke tyres, virtually custom-made to Schumacher’s taste. All the other teams had to lump it. Schumacher had special tyres that were designed specifically to benefit him. Sebastian Vettel has no such luxury. Quite the opposite. Vettel has to race with Pirelli tyres that are deliberately designed to under-perform. All the teams are given the same types of tyres, they have a limited number of sets, and they are designed to degrade quickly. Plus, the teams have to use both compounds of tyre during the race. This is an era where drivers tiptoe around the circuit in sheer fear of losing tyre performance. Not only does Vettel need to save his tyres. He also needs to make sure that his engines and gearboxes last for multiple races. Schumacher did not have to worry about that. That Vettel could win the Singapore Grand Prix by 33 seconds after a mid-race safety car while nursing a sick gearbox (and, incidentally, brake issues) speaks volumes for just how much pace he has in his pocket. Vettel also has to race in the DRS era. DRS is designed deliberately to disadvantage the car in front. That Vettel is able to pull so far in front that he doesn’t usually suffer from it is a testament his ability to pull out an impressive lead very quickly. Michael Schumacher also benefited from endless testing. If his Ferrari car wasn’t working, he could pound around the circuit in Ferrari’s back garden, test and test, gather more data, improve the car, rinse and repeat. No such luck for Vettel. Nowadays, testing is severely limited. Teams take updates to races not really knowing if they will work in real life, and the data must be gathered in Friday practice sessions at the same time as preparing for the race weekend. Through it all, Sebastian Vettel is a fair and clean racer. The “multi 21” incident may have been a bit naughty. 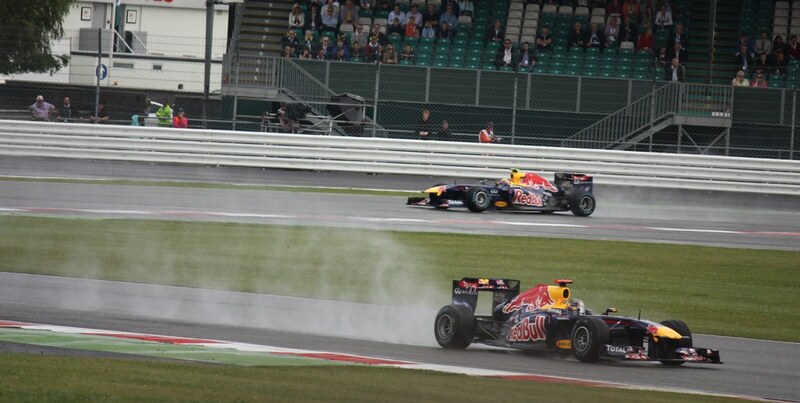 But even though he was disobeying team orders, he remained clean in the way he went about passing Mark Webber. Vettel tends not to make contact in wheel-to-wheel situations. Michael Schumacher’s tendency to barge people off or play dirty — such as parking his car at Rascasse — completely undermined his statistical achievements. Ayrton Senna, too, was not averse to crossing the line if he felt he needed to. Sebastian Vettel has never felt that need. He has achieved his success while being a true sports person and maintaining respect for his rivals. Another notable record of Sebastian Vettel’s is that he is the only person in history to beat five other world champions. Fernando Alonso, Jenson Button, Lewis Hamilton, Kimi Räikkönen and Michael Schumacher were and are all formidable opponents in race winning cars. Vettel beat them all to the 2012 World Drivers’ Championship on merit. Schumacher did not have anything like that level of competition up against him. OK, Mika Häkkinen gave him a run for his money for a few years. But beyond that, who were Schumacher’s biggest title rivals? Damon Hill and Jacques Villeneuve will probably go down as two of the least capable champions of all time. With all due respect to them, they both had a major car advantage the like of which does not exist today. In the 2000s, Schumacher’s strongest rivals were David Coulthard, Juan Pablo Montoya and his own brother Ralf Schumacher. He can’t exactly have been quaking in his boots. Besides which, the fact that Sebastian Vettel is on pole position a lot says something about how good he is. It is not as though qualifying is decided on a lottery. Pole position is earned on merit, by being the quickest driver on the track. Ayrton Senna was OK. But of course he can never be considered a true great because he only ever won his championships with McLaren. If anyone ever said that about Ayrton Senna, there would probably be effigies burning. So why do people slap each other on the back when they say it about Sebastian Vettel, who achieved as many championships with as many teams when he was still three years younger than Senna was when he won his first? Let’s not forget that Sebastian Vettel is the driver who won a race in a Toro Rosso. Sebastian Vettel has plenty of time left in his career to win championships for another team if he chooses to do so. Despite his enormous success, Sebastian Vettel still comes across as easily one of the most likeable drivers on the grid. Yes, the “multi 21” scenario was a bit out of order. But we expect this sort of ruthlessness from racing drivers. It’s a vital part of what can give a great driver the edge over a good driver. But off the track, Vettel comes across as one of the funniest, most down-to-earth drivers. It is a stark contrast to the aloof Michael Schumacher, the rude Kimi Räikkönen and the intense Fernando Alonso. That’s real mental strength for you. Is Vettel the greatest ever? I don’t know if Sebastian Vettel is the greatest ever. Of course, any such judgement is purely subjective. Comparing different eras is notoriously difficult. However, I do think that Sebastian Vettel is now the best driver in the current grid. And to compare him with Michael Schumacher — the most successful driver in Formula 1 history and a contemporary of Vettel’s — I feel that Vettel has a significant edge. Vettel looks fully capable of beating Schumacher’s statistical achievements. And he is doing so without a lot of the luxuries that Schumacher had. Most impressively of all, he is doing it without the big bag of dirty tricks that Schumacher had. Many thanks to @EnigmaF1 for pointing out that I failed to mention that Juan Manuel Fangio also won four World Championships in a row. Vettel isn’t the greatest F1 driver… yet. To a certain extent, I still think he needs to prove himself. There is a sense that everything was handed to Vettel on a plate, unlike Senna who had to take the team leader role away from Prost when he moved to McLaren. And that’s what the Schumacher-Ferrari partnership gives to Michael. They were nowhere near a title-winning team before he arrived. Schumi led them to the top and delivered the goods. But can Vettel be the greatest? Absolutely. And as a Schumacher fan, I can’t be any happier. Why? Because he’s Schumacher’s protege. Michael said it himself, if anyone will beat his records, he wants it to be Vettel. It would be a matter of “keeping it in the family.” After all, before Red Bull, before BMW, Vettel was discovered by Schumacher first at his Kerpen kart track. It’s funny you comparing him to Michael Schumacher. When Schumacher was winning everything under the sun people would bring up the excuses “he only wins in the best car” etc. Now it’s Vettel doing it suddenly that’s stopped being said about Schumi and they remember him winning for Benetton and how much he beat his team mate etc. Damn, I forgot about all the championships RBR won *before* Vettel arrived. This “greatest ever” malarkey is the most pointless attempt at comparison. Too much has changed over the 63 years of F1 to make any comparison possible. It’s pretty pointless comparing two current drivers that are not driving the same car – let alone all the other variables since 1950 that have an impact on rational comparison. Yes – he’s bloody good! But then you don’t get a super-license unless you are ( … or have wealthy backers, it would seem these days – so there’s another few degrees slope on the uneven playing field of comparison!). I’ve followed F1 long enough to see too many drivers’ statistics curtailed by severe injury or death … perhaps one or two of those, had they been born in the same year as SV would have been “even greater” … whatever that really means. He’s battled with his contemporary best to become WDC three times – and a fourth seems to be highly probable. That is merely a fact … not a comparison of ability driver ability. Statistics only compare statistics. The driver’s relative skill is only one small component along with opportunity, luck of those around him, and many other factors, that culminates in another statistic at the end of a race or season. They are not absolute measurements of “skill”, “ability”, etc, that can be placed in direct comparison against those of great names in the sport’s history to make any absolute, or otherwise meaningful, judgement. Better drivers may have missed out on being with the best teams, may have suffered injuries (or worse). “Statistically” … the chances are really high that out of the 864 drivers that have raced in F1 (Wikipedia) one of those other 863 will have been a “greater F1 driver” than SV … had things not contrived to prevent him reaching his/her potential. 1) He’s not a ‘great’ driver until he has driven for a bad team. This argument is usually fielded by young girls who cite that his win in 2008 in the STR doesn’t count for anything, because the STR managed to beat RBR. They forget that in 2008, the RBR really wasn’t that good! And by this logic, Hamilton is also not a great driver, as he has only ever driven for McLaren / Mercedes. 2) He still needs to prove himself. My problem with this argument is… what exactly does Vettel have to do in order to prove himself? Has he not done enough already? Is there a certain number of championships he has to win before people will consider him great? Has he not done his time at lesser teams with Sauber and Toro Rosso? Sure, the RBR may be the best car on the grid, but there is plenty of evidence to show that Vettel has done a better job with it than Webber has, and Webber is far from being a bad driver. For me, Vettel is definitely one of, if not the greatest driver on the current grid. He has definitely improved in recent times especially. I used to think that if you sent Alonso, Hamilton, and Vettel in equal equipment into a corner, Vettel would come out third. Today I think he stands a really good chance of emerging first. David, you make an excellent point. Of course, comparing drivers is ultimately futile and as you rightly point out there are so many variables that it is impossible to judge. But it is good fun discuss it. I don’t really think Vettel is the greatest F1 driver. The title of this article only asks the question, because I think it is interesting to ask, particularly when Vettel’s amazing achievements are often downplayed by so many. I have to admit feeling a bit awkward about this question, largely because I do not believe that there is such a thing as “the greatest driver ever”. Perhaps there would be if Grand Prix racing was a scientific discipline. However, it still retains a certain amount of art, which is part of the attraction of watching. All the great drivers have subtly different ways of reaching the pinnacles of their respective successes, which lead to some being more attractive to others, and beauty being, to some extent, in the eye of the beholder. For me, picking a “greatest driver ever” is a bit like discussing who is the greatest painter in history – intellectually interesting but not particularly informative. In a way, if a driver is mentioned seriously in such a discussion, they’ve made it and proven their greatness – regardless of what is said afterwards. There is, however, a group of drivers who are better than the rest. Regardless of era or approach, they all have the near-total understanding of racing’s fundamentals and of the advanced things that separate the good from the great. They have an instinctive understanding of the sport that eludes all the rest of us – including their rivals. Sebastian Vettel is emphatically in this group. I do think Sebastian Vettel has benefitted somewhat from team orders, though rarely as directly or one-sidedly as Michael Schumacher, Fernando Alonso or several of their predecessors. This is probably because neither Sebastian Vettel or Mark Webber appears to have a high opinion of such orders – witness Sebastian’s frequent ignorance of instructions over team radio, concerning things like sticking to target lap times. The benefit, as a result, tends to come from the same biased environmental issues as plagued Renault when Flavio Briatore was in power. Fortunately for Red Bull, there has been a small but powerful minority (including Dietrich Mateschitz) that has been highly pro-Mark (without being anti-Sebastian) and able to control the worst excesses inherent in that approach. He has also benefitted from Adrian Newey’s sustained genius and Red Bull’s ability to maintain its successes. (Lewis Hamilton’s career suffered when McLaren lost its way in 2009). It is clear that Sebastian has contributed to the latter in terms of giving the team motivation, which is a powerful plus point. The trouble is that it means Sebastian is unlikely ever to switch teams. Toro Rosso and Red Bull are considered “the same team” by a lot of fans, at least in terms of having the same ethos and attitude. This means some people will never take a claim for him being superior to some other favourite seriously (most drivers swap teams at least once, if good enough to be debated this way – Jim Clark being the only exception). What makes this particularly unfortunate is that the mutual loyalty is more to Sebastian’s credit than detriment – if a driver is among the greatest, and inspires a team to be and feel great, why would that team let such a treasure go? The “wacky races era” problem is unfortunate. In a way, it’s degraded every driver’s claim to the respect they deserve for their driving. It doesn’t help that most teams don’t seem to understand the basic elements of how to succeed in this era (Red Bull do, and some other teams – in various parts of the grid – have fragments). Pole position is earned by the combination of the best car, understanding of race strategy (tyre management now starts in Q1) and, as a tie-break, driver skill. If you have pole through a sensible strategy and don’t do anything stupid on the first lap (Lewis Hamilton, I’m looking at you), then you should win the race. It’s difficult to support a claim that beating an opponent is to do with driver skill in an era where driver skill has so little to do with it, especially relative to, say, 3 years ago~. (This is also part of the reason why Sebastian gets artificial barriers like “win championships with multiple teams” imposed on claims to his greatness). At the moment, all that can be said with certainty is that Sebastian is better than Mark Webber – and since Mark never got a proper opportunity before encountering Seb to establish his true level, it’s thrown many people’s ability to sensibly judge either compare to their contemporaries, let alone past greats. This is unfortunate. The indicators Sebastian has put down in his career (which Duncan has explained well in his entry) suggest he really is as great as all that hype suggests and a bag of chips. Increasingly, driver selection happens in ways that reduce the amount of skill on the grid. If Sebastian was lucky, it was in one thing – he got into F1 in 2007, the last year where there were both vacancies on the grid for people who weren’t 4-time champions* and enough opportunity to test to enable Sebastian to fulfil the greatness within^. I look at the relatively poor drivers who have come through since Sebastian and worry if we will ever see another driver join the glorious ranks that Sebastian has done. ~ – To the doubters: note that Sebastian’s first title, and arguably his most challenging, was in 2010, and thus in the “more credible” era. Subsequent glories augment an already well-established talent, not invent something out of thin air. * – The only vacancy on the 2008 grid was Sebastién Bourdais, who had won the CART championship 4 times. In 2009, in-season testing was banned and other forms of testing heavily curtailed. ^ – I don’t count being on the Red Bull scheme as luck; while Sebastian couldn’t have known that was the scheme that would deliver him straight to a championship team after completing the “F1 apprentice” element, he did impress enough on merit to be selected for that scheme. Thanks for the comment Alianora. A very sensible and interesting analysis. A really compelling argument in favour of Sebastian Vettel’s strengths as a GP driver, systematically dismantling some of the arguments against and even some of the myths around him. The arguments about needing to win with another team and about his rapport with Helmut Marko were particularly well put. However, despite that, I can’t help but feel the Mark Webber thing won’t go away from him. There is a lot of evidence that Sebastian has, particularly in 2011 and for most of 2012 and 2013, earned the team’s focus by being the better driver pure and simple. However, there is also some evidence that Mark hasn’t always had a fair crack of the whip and, however disproportionately such instances are blown up by the press, they will probably remain. The only other two things I think that go against him are a) his youth and b) his habit of making it look so easy! I don’t think it’s wrong to have a debate on the GOAT (Greatest of all time), even if we’re all aware of its flaws. But I’d argue it’s probably difficult to do one at such an early stage of Seb’s career when we don’t know what challenges may await him. B) I think is why so many people get annoyed or don’t fully appreciate him when he wins; he’s a bit like Alain Prost in that he makes winning look so easy and undramatic that people tend to, perhaps perversely, understate his achievements (and start talking about the car, multi 21 etc.). By contrast, many (myself included, albeit only just and I do think Vettel will be better when he’s 32 than Alonso is now) tend to think that Alonso is better than him because they see him qualify all the way down the grid and fight his way through so they really see the effort he puts in to get the result! To be clear, this is not Vettel’s fault but it’s probably one other reason why some people are sceptical! None of this detracts from the original point that this is a really good article though! Thanks Rishi. Another great comment. All Vettel has to do to be considered a great is to race with Lewis or Kimi or Fernando in the same team, then we will see how good/not so good he is. Redbull could have hired Lewis last year when his management offered his services to RBR, or Kimi or Fernando this year (to drive for them next year). But I suspect the reason RBR did not take up the services of Lewis, Kimi or Fernando is because they don’t want to expose Vettel for what he truely is (a good driver in by far the best car). For those of you that say what about webber and why isn’t he performing like Vettel? Exactly! Why was Webber not on Vettels pace in Singapore 2013? 2-3 sec a lap slower then Vettel in the race.. With that in mind Webber should move aside asap and let someone truely deserving of the best car in the field drive the RBR. All that Webber is doing is allowing for people to exagerate Vettels abilities in a car that is 2-3 secs a lap faster then the rest. And RBR arent doing Vettel any favours by hiring Ricciardo for next year, as we still won’t know how he would compare to what most experts best drivers i.e Fernando Lewis and Kimi. I think he is vey talented, but not a best driver yet. He just needs to maintain his best performance as Schumacher did. I believe the recent interview Schumacher gave to BBC F1 highlights the motivations both he and Vettel seem to share. They aren’t so much racing the rest of the grid, but racing themselves. That’s why they didn’t need a strong teammate to push them. I also believe that is what separates Vettel from Alonso, and Hamilton because their combined tantrums this year show they are feeling pressurized by Vettel’s dominance. Very interesting perspectives, thanks for the comments. 1. In light of his performance this year, do we still feel Vettel can be considered one of the top 2-3 drivers of all time? Or even one of the best 2-3 drivers on the grid currently !? 2. Interested that many people in this thread quote Schmuacher as the standard to be compared against, rather than Fangio or Senna. 3. Re:Ben Jones comment – the tantrum’s Vettel has had this year about everything from engine noise to the car, and his imminent departure to Ferrari (after one season of having the 2nd/3rd best car) put Alonso/Hamilton tantrums (after four seasons of having 2nd-5th best car) in perspective? 4. Re:Alianora – well, he’s moved teams now! 5. 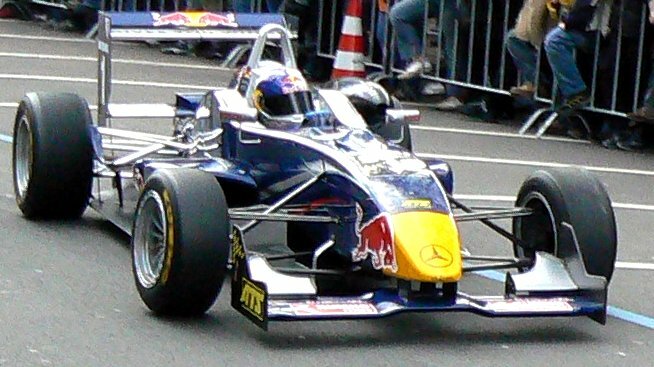 Vettel was clearly favoured over Webber – in tactics, parts, and development focus of the car. With respect, 2014 finally debunks the Mark Webber comparison, the notion that noone on the current grid could beat Vettel in the same car, and claims of the inability of past champions to take the race up to him. What will we say at the end of 2015?